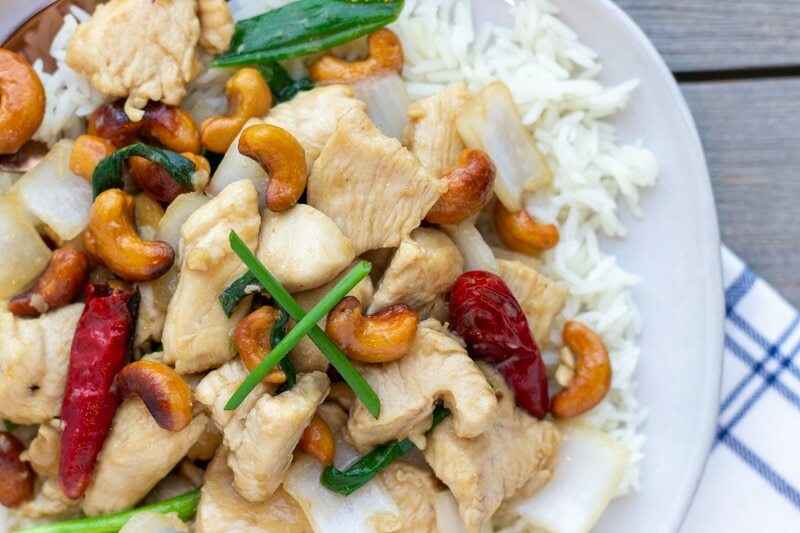 Thai Cashew Chicken combines flavors of Chinese and Thai with roasted chili peppers, onions, juicy chicken, and crunchy cashews. I use to love Chinese takeout, especially in my college days…Panda Express was life lol. If I knew then what I know now, I would have realized how much money I was spending on takeout and how much cheaper it would have been to just make it myself. Not to mention the amount of sodium and fat in most Asian fast food is enough for a person’s entire daily allowance. 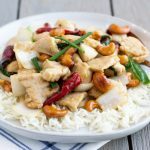 Nowadays I love recreating takeout favorites at home, like Cashew Chicken, and feel better knowing I can control the ingredients in my dishes and save money by eating at home. 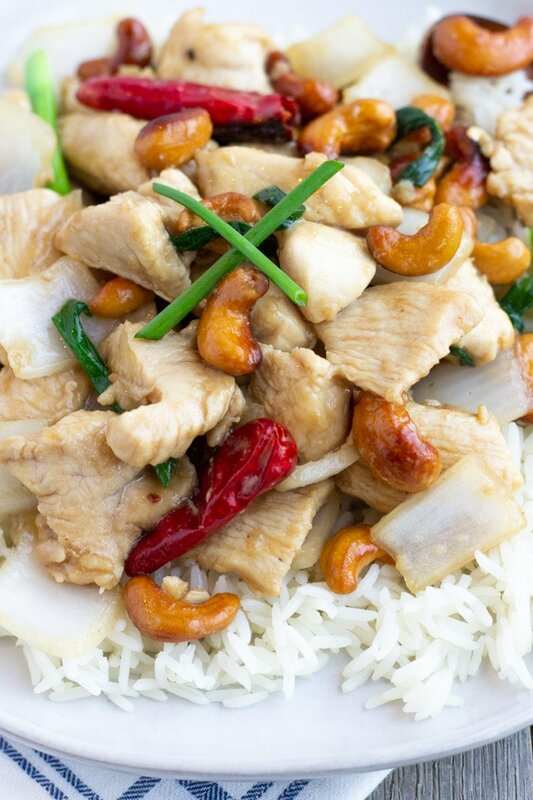 I love the addition of cashews and peanuts in stir-frys. They bring an element of crunch and pack some extra protein. In order to prevent the cashews from getting soft, you’ll have to give them a quick fry in some oil. I say quick, because they can burn easily as some of mine did, but still tasted good. You’ll want to do the same for the dried Chili Peppers to bring out the heat from the pepper. I used dried Thai bird’s eye chilis, but dried Szechuan are more common. With all stir-frys, have you ingredients prepped prior to even turning on the stove. You’ll want to give the sliced chicken breast a dusting of flour just to help the moisture stay in and absorb the sauce. I used a wok for this dish, but you could also use a large skillet. 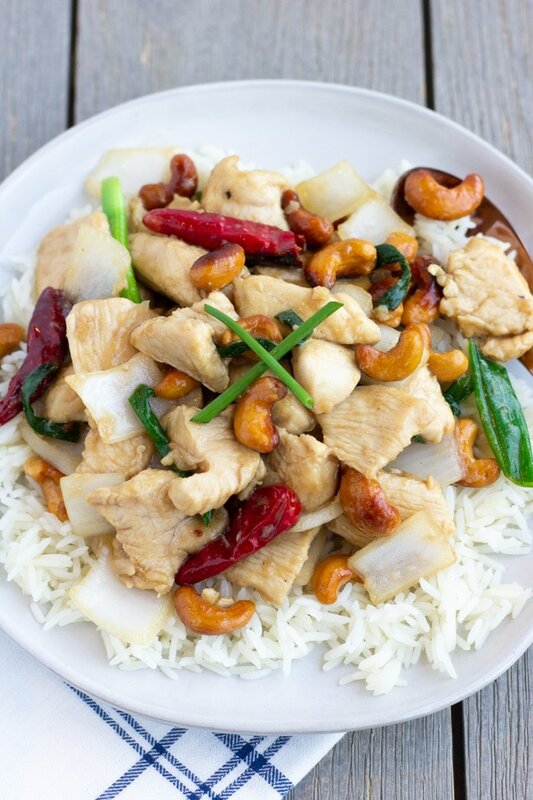 Serve the cashew chicken with rice, or cauliflower rice for a low carb meal. If you need this dish to be GF, you can skip the flour, or use GF flour, and substitute Coconut aminos, liquid aminons, or tamari sauce. 1 Tbsp Water Add water if your sauce is too thick. Place Oil in a wok over medium heat. 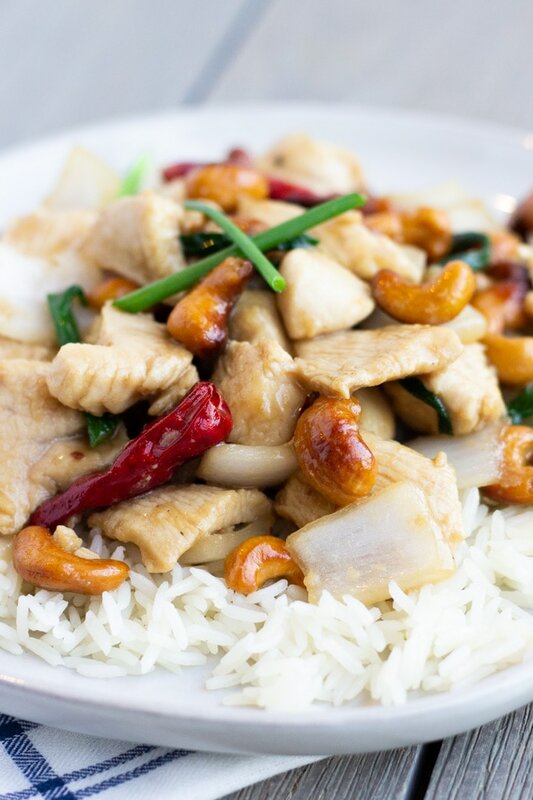 Add Dried Chili's and Cashews and fry quickly for about 20 seconds, just to release aroma from peppers and add crunch to cashews. Remove with a slotted spoon and drain on a paper towel. Mix flour with sliced chicken breast until all pieces are coated. Bring heat on wok to medium high, add Chicken and cook thoroughly. Add sauce mixture, onions, half of green onions, cashews, and chili peppers. Stir well. Allow sauce to bubble and onions to soften a bit, then turn off heat, add remaining green onions and serve hot with rice.